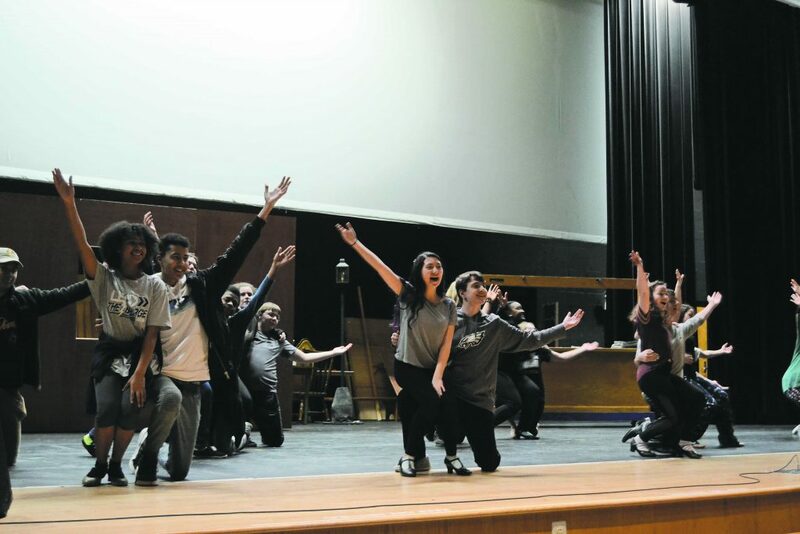 Timber Creek High School’s musical production team is taking on a classic for this year’s spring musical in the critically acclaimed “Guys and Dolls.” The show takes place during the backdrop of World War II, set in New York City. It follows the antics of two gamblers, Sky Masterson and Nathan Detroit, as they try to make a living in the world with police always on their tails and the women in their lives causing them heartaches and headaches. The show is directed by Carolyn Hand, the theater arts teacher and musical director. This is her fourth year since returning to direct. Hand was the original director when the school opened in 2001. She transitioned to work on the business end but eventually returned. She has put on shows such as “Godspell,” as the steampunk version of that play, “The Addams Family” and “The Wedding Singer.” She likes to give her students a well-rounded education and doesn’t like her current show to be like the previous one. This year, she wanted to tackle something classic. Doing consecutive successful shows is at the forefront of what Hand contributes to the increased inclusion from her students, particularly the males. This is evident in two of her leading roles of Sky Masterson and Nathan Detroit, both of whom are being played by two sophomores, Jack Kornicki and Ryan Lynd. This is both Kornicki and Lynd’s first major role after playing bit parts in the past. For Lynd, it’s not exaggerating to say he was not expecting to fill the shoes of Nathan Detroit. He had a much different role in mind. When he found out he was awarded the role of Nathan he was surprised but also happy because it was a lead role. His previous work includes narrator four in a production of “Beauty and the Beast” when he was in eighth grade. An aspect Lynd likes about playing Nathan Detroit is how he is a bit of a procrastinator, like himself. “He’s definitely sort of jumpy and he’s really like a wait to the last minute guy,” he said. This, however, will be Lynd’s first time working with this production team and he has taken a shine to how they do things. Lynd hopes to finish out his high school career doing more productions with the school. Kornicki is fond of his character, Sky Masterson, because of how he is the polar opposite of the character. A leading man is not anything without his leading lady, and there are plenty of leading ladies in this show. Claire McDermott, a junior, playing the lovable and sincere, Sister Sarah Brown, is very familiar with being on stage, having already been a part of over 10 shows. She began her career on the stage in eighth grade and has since taken on small and big roles. She is infatuated with her character because of what she represents. McDermott likes showing a side of her fellow students don’t see every day, but a side of her that comes out when the lights are on and the stage is set. She described Sarah Brown as a fun-loving character, but doesn’t always get to show it. “She likes to have fun, she’s funny, she doesn’t get around much but she wants to,” she said. McDermott described her character as being an introvert, a quality she sees in herself, but something she likes about the character. Another actress who will show off her acting chops is senior Hayley McCann. McCann is taking part in her second show with “Guys and Dolls.” The first show she was in with the theater group was “The Wedding Singer” last year. She is thrilled about bringing this classic story back to the stage. McCann loves playing Aunt Arvide Abernathy, a female interpretation of the lovable missionary character, because of how much she relates to her. McCann sees herself as an optimist, and that’s one of the things she really likes about her character, being able to see the best in people is valuable, but it also was unique in the 1950s. “There is a lot of negativity in this area, so having people like her and other people in the missionary band to sort of try to lighten things up and letting them know that resorting to sin is not the answer to better themselves,” said McCann. A lot can be said for how much this group loves working with one another. The common theme throughout show has been family and how the actors love working with the directors and vice versa. One of McCann’s favorite parts has been simply working with the cast. “We all sort of became like a big family,” she said. They found a way to create a bond while doing the show. Hand had the same sentiment about the family aspect. Hand has been very receptive to input on the show and likes that the cast and crew are committed enough to do so. “We all are a part of it, and that I think is what makes the show what it is, and I think that is what makes everyone feel they are a part of a family,” Hand said. Overall she wants people to come see the show, and she wants her students to have fun while going through this process. You can see how all of their hard work has paid off April 11 to 13. Curtains go up at 7:30 p.m. at the Timber Creek Auditorium. Online tickets are $8 for students and seniors and $10 for general admission. Tickets can be purchased at the door. To purchase advance tickets, visit https://www.showtix4u.com/events/16340.